WASHINGTON (Sputnik) - US President Donald Trump and his French counterpart Emmanuel Macron discussed on Saturday the recent joint missile strikes against Syria and agreed to continue the international fight against Daesh terrorist group, outlawed in Russia, the White House press service said. 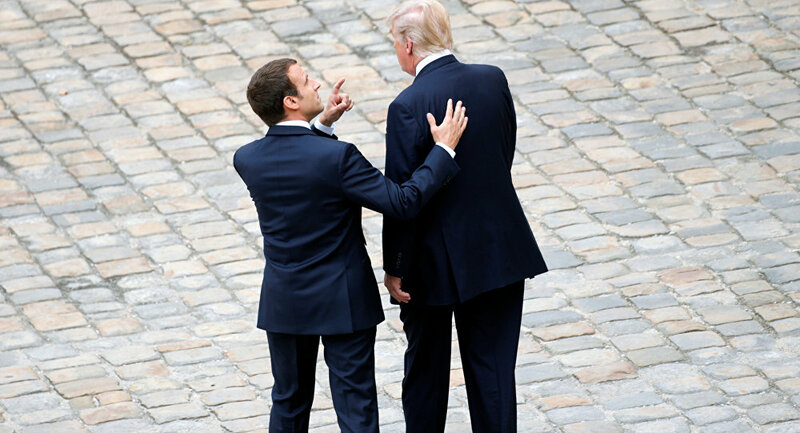 "President Donald J. Trump spoke today with President Emmanuel Macron of France to discuss our collective response to Syrian President Bashar al-Assad’s use of chemical weapons on April 7. Both leaders affirmed that our joint airstrikes were successful and necessary to deter Assad from any further use of chemical weapons. They also discussed the need to reinvigorate multinational stabilization efforts in Syria to ensure the long-term defeat of [Daesh]," the statement said. Earlier in the day, Washington, Paris, and London fired missiles on several targets in Syria, which the Western forces believe are linked to Damascus’ alleged chemical weapons program. The attack followed the reported chemical weapons use in the Syrian town of Duma. The Western states put the blame of the attack on Damascus, while the Syrian forces firmly denied the claims.